EUAM Ukraine and AgriTeam Canada agreed today to pool their expertise to strengthen the leadership skills of law enforcement officers in Ukraine and improve their first response incident management. They also agreed to work together on a Training and Development Needs Assessment for the Ukrainian police. 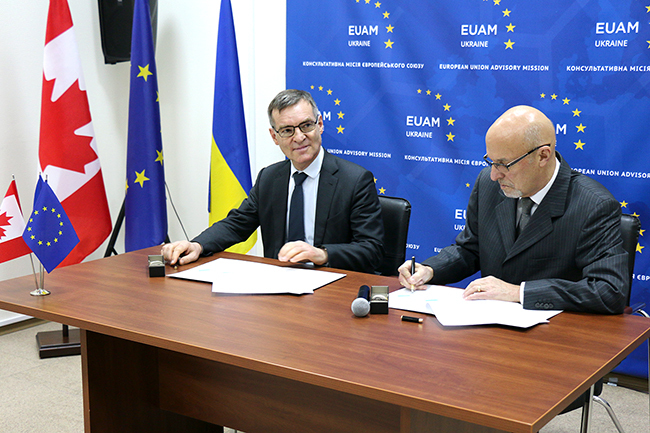 The Memorandum of Understanding (MoU) which forms the basis of this cooperation was signed at the EUAM Ukraine headquarters in Kyiv by Hugues Fantou, EUAM Acting Head of Mission and David Viveash, Agriteam Field Director. The Ambassador of Canada to Ukraine, H.E. Roman Waschuk was in attendance as were senior staff from the Ukrainian National Patrol Police, including the Head of the Kyiv Patrol Police Yurii Zozulya. “This agreement builds on the strong existing cooperation between EUAM Ukraine and Canadian authorities and organisations in efforts to support our Ukrainian partners. I would like to express my appreciation for this relationship, of which this MoU is part,” said Mr Fantou. “Today, we are formalising a relationship which has been a very rewarding informal relationship for many months. We have worked very closely with EUAM partners in a number of areas including defining a common understanding of ‘community policing’,” said Mr Viveash. The formal cooperation will start on 18 January, with the launch of the first of two one-week Executive Development Courses for top management in the Ukrainian Patrol Police. Shortly after, on 20 January EUAM representatives will join Canadian, Ukrainian and international colleagues to work on a new Training and Development Needs Assessment for the Ukrainian police.